Foaled in Denmark, this Connemara mare is a grand-daughter of the great Irish Connemara stud Oxenholme Marble. With owner Sean Sunner of Garryhinch Stud, she won numerous in-hand Supreme Championships. "Banks" was then acquired by Noel Noonan at Manor Connemara Ponies, who teamed her with rider Samantha Roberts. 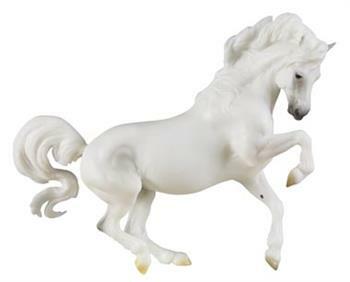 The striking snow-white grey won 12 major championships in one year culminating in victories at two of England's most iconic shows - the Horse of the Year and Olympia. With nothing left to prove, Banks was retired as a broodmare - in Connemara, at last. "Special shipping rate on this one"